I love when brides and grooms are game for anything, even after they've just spent hours getting into their Indian wedding outfits. This bride had her getting-ready preparations at her home, which had plenty of room for her hair and makeup artist, photographer and videographer. Most Indian brides take three full hours to get fully ready, as hair, makeup, getting dressed and putting on the wedding jewelry takes a long time. 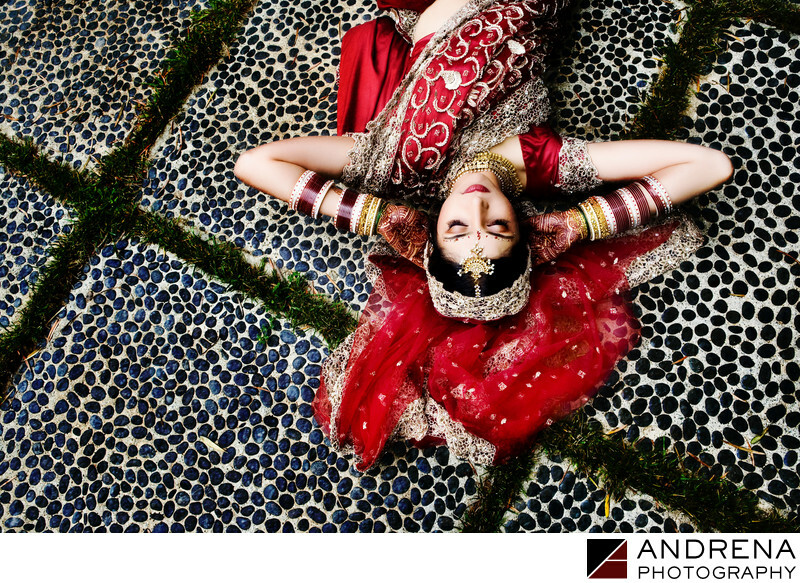 So once a bride has sat through all of this, and she looks perfect, I often think that the last thing she'd want to do is something creative that involves lying on the ground. But I have been incredibly blessed to have so many brides and groom be willing to do just about anything to create a unique portrait. For this photograph, I asked if the bride would be willing to lie down on the pavement in her back yard, and I was delighted when she said yes. The end result was a peaceful portrait that has been published in several magazines. The bride herself got married in the park just below Trump Resort in Rancho Palos Verdes.